For many, the daily use of a small bathroom, particularly in a home with children, is a practice in futility. Each morning there is a fight over who will get there first and what their time allotment will be. In addition, those using the bathroom often have to endure the constant pleading of those outside to get out or at least let them in. However, there are benefits to having a small bathroom, specifically when it comes time to remodel. The limited square footage available means that less materials will be needed and therefore, less cost. It also means that you can experiment with luxury items such as marble or quartz without fearing the the final bill. In essence, a small bathroom is the perfect place to realize your design dreams for a high-end, hotel experience in your own home. The following guide is designed to get you started on your own small bathroom remodel project by walking you through the process and giving helpful hints along the way. Master bath – This is often referred to the ensuite as it is typically designed for the exclusive use of the “master(s)” of the house. Depending on its size it may include a full bath or a partial bath. Full bath – A full bath is just as it sounds. It contains a sink, toilet, shower and bathtub. Partial bath – Also referred to as a partial bath, this type of bathroom typically contains a sink, toilet, bathtub or shower. Powder room/ ½ bath – This bathroom is typically meant for the use of guests and will only contain a sink and toilet. 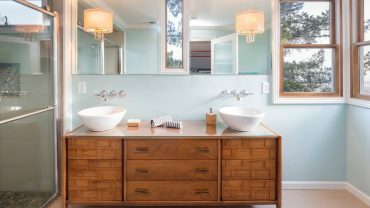 Remodeling a small bathroom to reflect your unique design style, while fulfilling your needs for function and storage, can be challenging. This is especially true when you are required to work within the original footprint of the bathroom, without the option to expand. Thankfully, there are lots of ways to maximize the space that is available and accommodate a few luxury features at the same time. 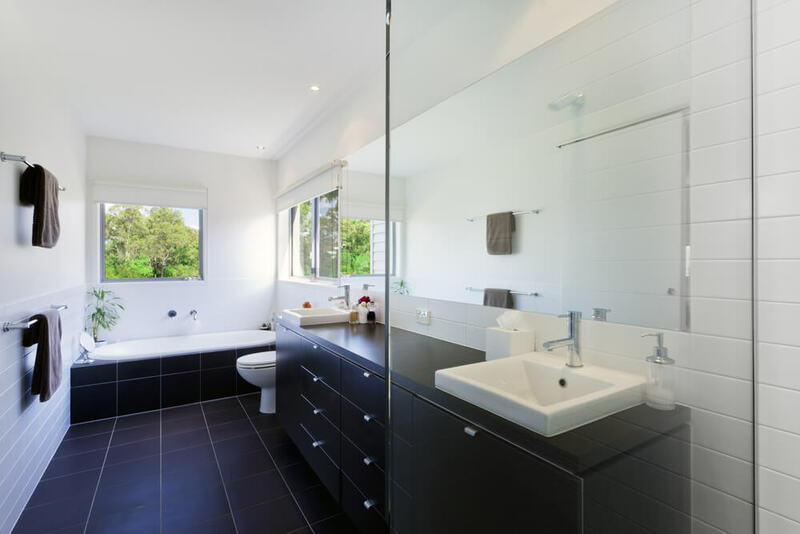 The most common layout for a bathroom, whether large or small, is the single-plumbed wall. 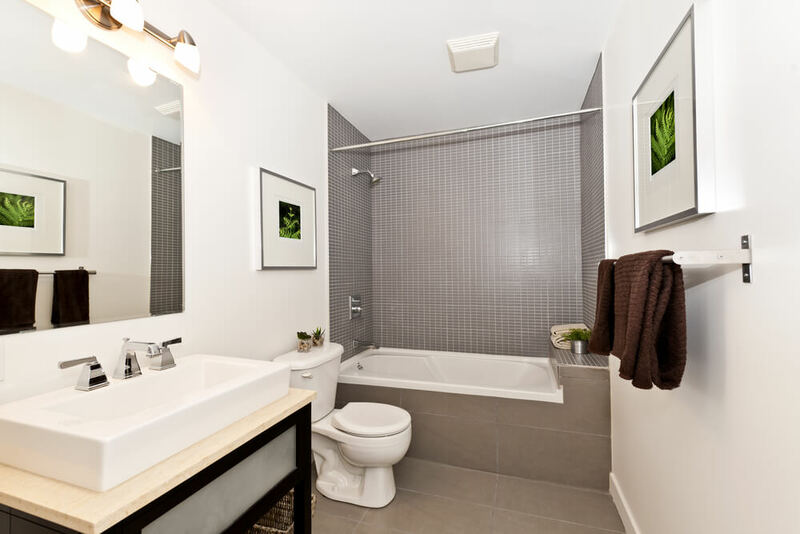 This type of bathroom houses all of the plumbing fixtures, sink, toilet and shower and/or bathtub along one wall while leaving the opposite wall open. Regardless of your current plumbing configuration the easiest way to save on remodel costs is to maintain the same plumbing layout and work within those boundaries. 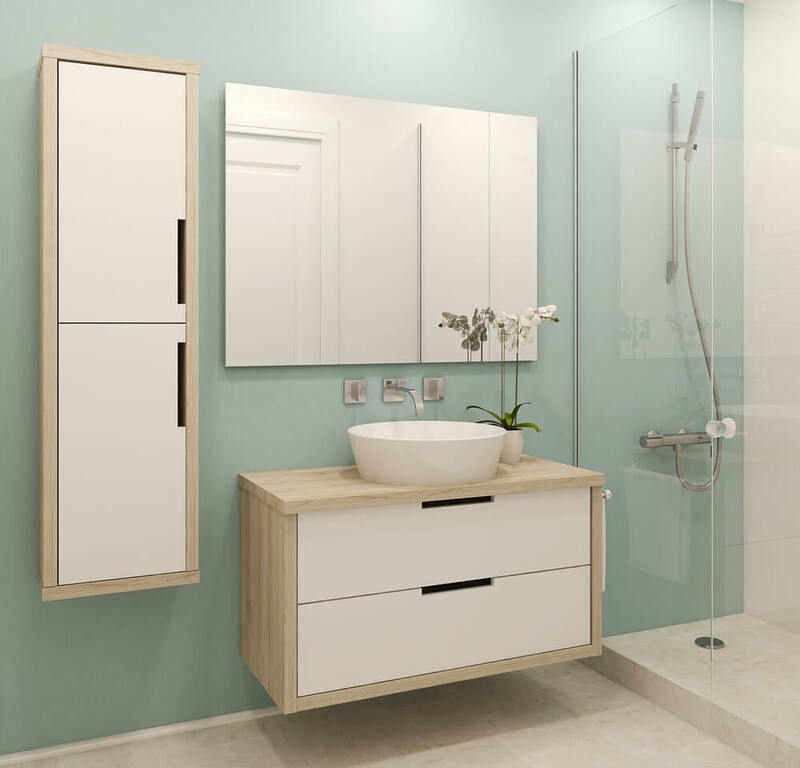 While you can get vanities and custom showers in all shapes and sizes there are a few standard dimensions for bathroom fixtures. Using these dimensions in your bathroom floor plan will let you know whether or not you have room for some of the extras like a double vanity or bidet, or if you will have to stick to a basic plan. A standard bathtub with an apron front is 60 inches long, 30-32 inches wide and 14 to 20 inches deep. The ideal clearance for a toilet is a width of 32-36 inches. The ideal clearance for a single sink is a width of 36 – 48 inches and for a double sink, 60 – 72 inches. • Is the bathroom an ensuite, guest bathroom, family bathroom or a combination? • Who will be using the bathroom? • What are the must haves? Tub or shower? Double sinks? • What is the budget? Have you considered setting aside 10% for incidentals? • What is your particular design style? Check out HGTV’s worksheet, A Day in the Life of Your Bathroom, to determine the needs of you, your family and how they can be met in a bathroom remodel. The materials you choose for your bathroom remodel will determine the success of the project. However, there is no need to worry, it doesn’t have to be rocket science. Instead, make material choices that reflect your style, budget and lifestyle. For example, a bathroom that will almost exclusively be used for children should contain durable and long lasting materials. This may not be the place to install expensive marble countertops. If you still find yourself asking questions, you may consider consulting a professional in the field such as an interior decorator or designer to help you make a well-informed choice. 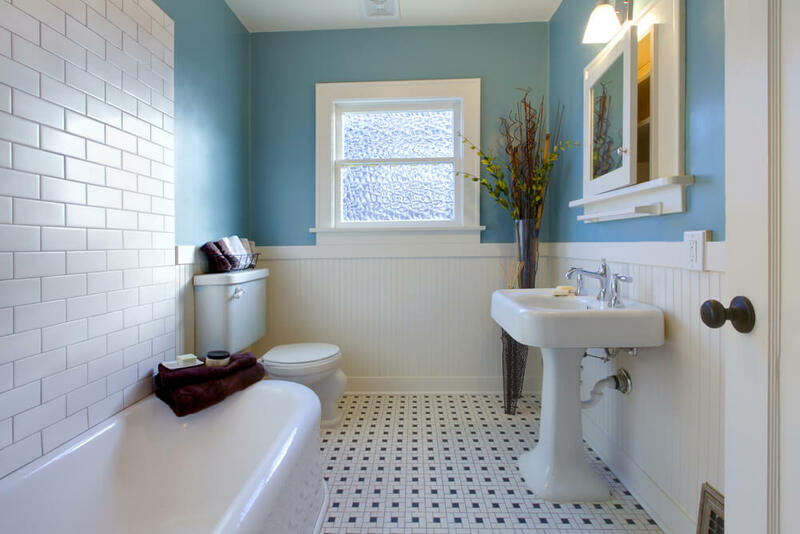 When it comes to bathroom flooring one type of material is the overall favorite, tile. Whether it is ceramic, porcelain, marble or slate, tile is a great choice for the bathroom because of its durability and water resistance. Floor tiles can be purchased in a variety of sizes such as 12×12, 18×18 and 12×24. In a small bathroom the general rule is to install larger tiles because they give the illusion of more floor space. However, this rule can be broken for styles of tile like penny tile. Penny tile’s round edges provides a curved surface to walk on, as well as providing a nod past design styles in a classic way. Vinyl tile is also a good option for bathroom flooring and with advances in technology there are a multitude of options available the mimic the look of natural stone. Classic bathroom with vintage black and white tile. Contemporary bathroom with contrasting black and white tile. Small bathroom with contemporary gray tile. Due to the frequency of use and constant contact with water, bathroom countertops must be durable and hardworking. Thankfully, there are a variety of materials available that are ideal for a bathroom environment. The budget-friendly option is laminate. Laminate comes in a wide array of colors and patterns that are designed to mimic the look of high end products. While it is resistant to water, it can fade and discolor overtime. Natural stone and quartz are options available for those with a larger budget. However, if you are remodeling a small bathroom, you may be able to indulge in these surfaces because you will likely need less of them. Both natural stone and quartz are low maintenance and highly durable. Granite also handles heat well which makes it an excellent choice when curling irons and straighteners are to be used. 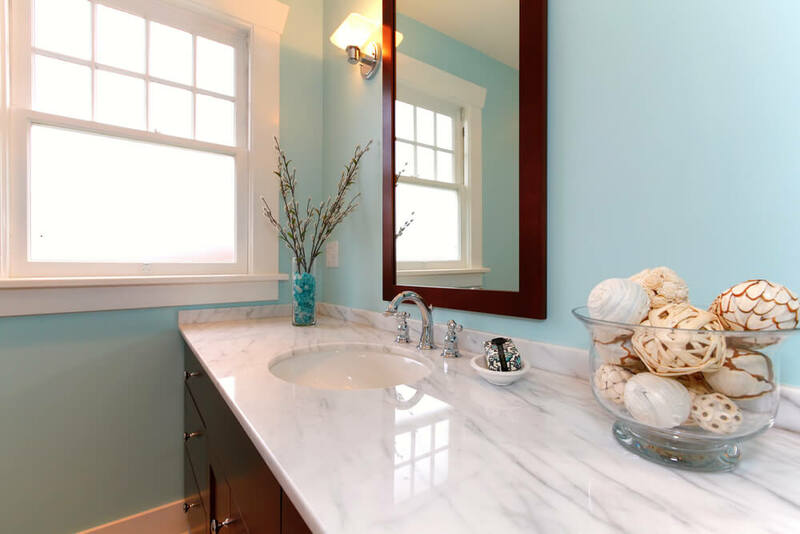 Bathroom vanity with beautiful marble countertop. Small bathroom with solid surface, seamless countertop and undermount sink. A beautiful backsplash or accented tile wall acts as the jewelry of the bathroom and provides a focal point for the space. It is becoming increasingly common to find bathrooms, both small and large, with a large portion of tile installed on the vertical spaces. This is due to the natural beauty of tile, its water resistance and the clean look it provides. A small bathroom is a great place to experiment with a colorful tile backsplash or accent. If you are more reserved in your design choices you may consider, for example, subway tile as your main tile selection. From there you can introduce a color glass mosaic to be installed in a horizontal or vertical stripe somewhere in the space to add a pop of color. This provides a custom feel with committing to an entire wall of vibrantly-colored tile that is likely to look dated over time. In general, try to keep the types of tile installed down to three selections: one for the floor, one for the main wall or shower and an accent tile. Cottage bathroom with subway tile and gray grout shower surround. 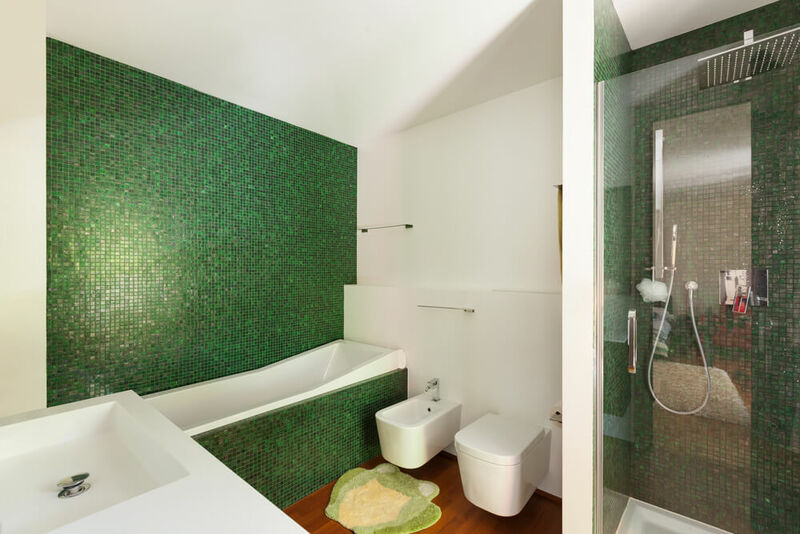 Modern bathroom with emerald green mosaic tile. Cozy bathroom with multi-tone blue vertical tile installation. A small bathroom doesn’t need to be covered floor to ceiling with marble tile to feel luxurious. There are plenty of ways to add a sense of extravagance without going overboard and breaking the bank. In fact, your small bathroom may be the ideal place to experiment with a new style of tile or bathroom technology. The reduced square footage of the space will translate to a smaller price tag for items like flooring, countertops and backsplash tile. One way to create a spa-like feel in your bathroom is to install a few luxury technology items. 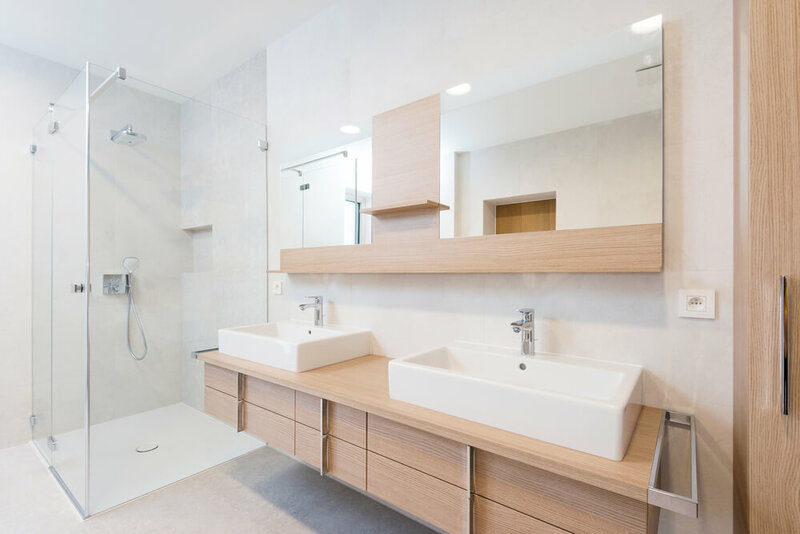 While these additions may seem extravagant at first you may soon discover that your bathroom is your favorite room in the house because of them. Bathroom with custom steam shower. Small bathroom often suffer from a lack of sufficient lighting. However, this can be remedied by the installation of a window, skylight or additional lighting fixtures. 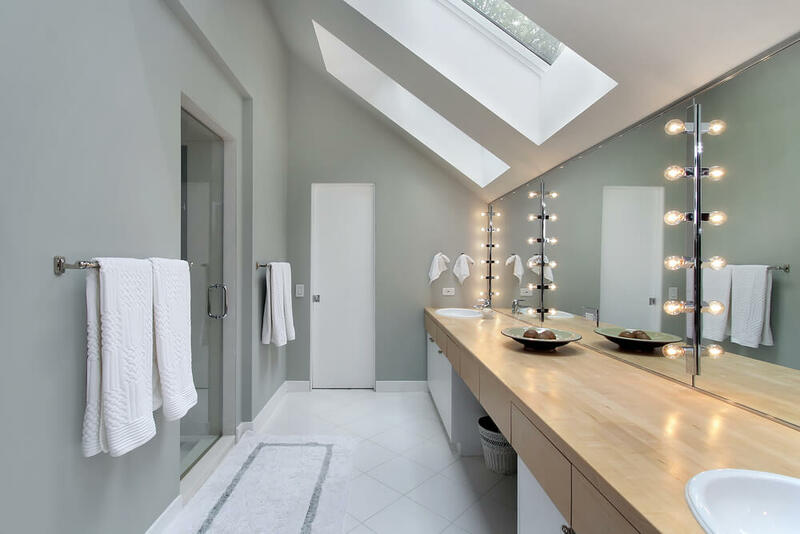 Bathroom with peaked ceiling and two skylights. Don’t forget the accessories. While space may be limited, a curated collection of bathroom accessories can provide the perfect finishing touch to a bathroom remodel. Sometimes it is these finishing touches that complete the space and make it feel inviting. It’s important to balance the hard surfaces of the bathroom with items that are soft such as spa towels and a small area rug. A coordinating piece of artwork can add interest to a bathroom, even a small one. It can also provide a color palette to base the room on. Nautical-themed bathroom with decorative paneling and accessories. 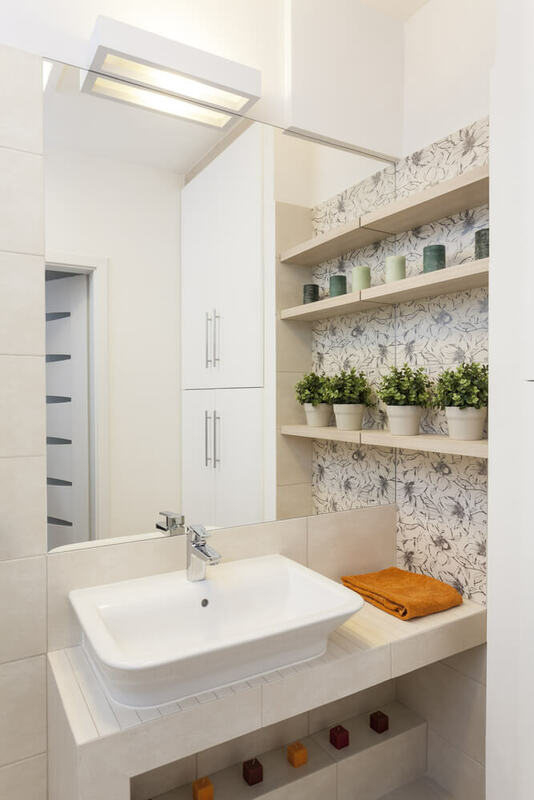 Small bathroom with floating shelves displaying greenery and candles. 1. Choose an important bathroom item – tile sample, artwork, towels – to pull your color scheme from. This may be the colorful, blue and aqua glass tile that you have selected to accent the shower or it may be chevron-patterned shower curtain that you have recently bought. Whatever your jumping off point is, use this to pull two or three colors from, if possible. 2. Once you have decided on your color scheme you will need to make a decision on how it is implemented. For example, your three colors may be gray, aqua and navy. 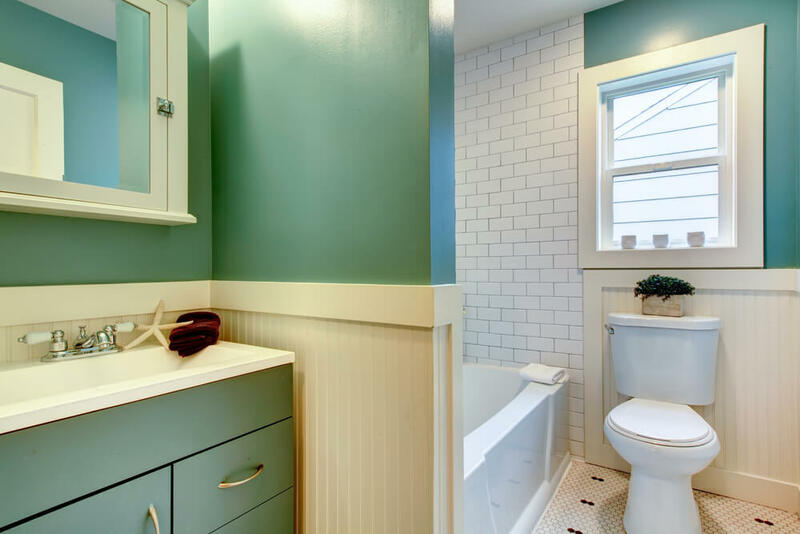 Therefore, you could choose to paint the walls of the bathroom gray while accenting the space with navy towels and a few aqua colored accessories. The benefit to choosing a gray as your wall color is that it is a neutral and can coordinate with a variety of colors and styles. You won’t have to change the wall color if you decide it’s time to get new towels. Another factor to consider in choosing the right color scheme for your bathroom remodel is who will be using the space. If the bathroom undergoing the transformation is going to be used primarily by children you can feel free to be a little more adventurous with your choices. A great combination for a kid’s bathroom is white subway accented by a stripe of lime green or navy blue tile. 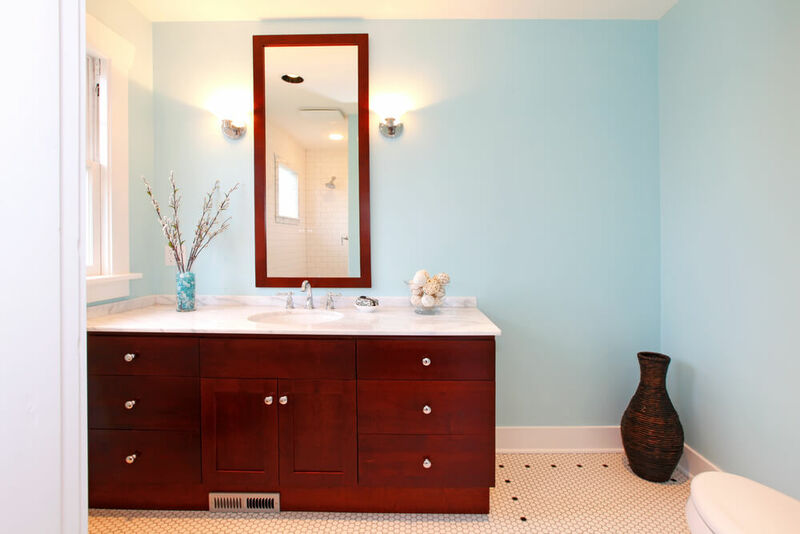 You may even consider painting the vanity a bright color to go with the space. In contrast, powder rooms or ½ baths are often decorated in a more dramatic fashion. Because a powder room is less frequently used and not in regular contact with the steam from a shower or tub, you could choose to install dramatic wallpaper instead of traditional tile or paint. Scandinavian bathroom with neutral color scheme and unique combination of warm wood and glossy tile wall treatment. 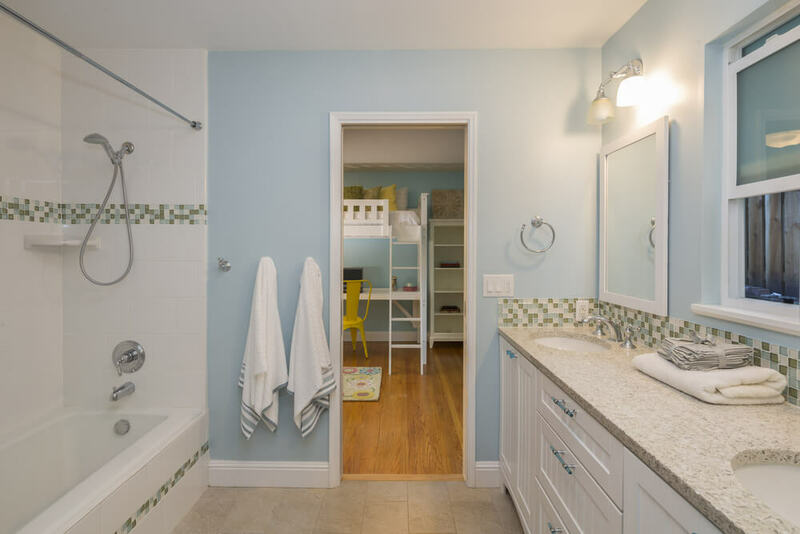 Kids bathroom with light blue walls and coordinating accented mosaic tile. 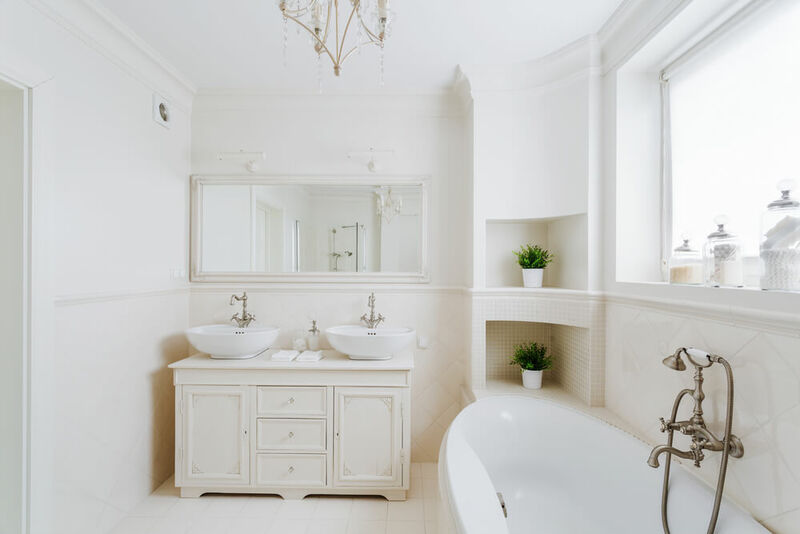 Light and airy bathroom with white and cream color palette. Both contemporary and modern design are popular choices for today’s homeowners. However, these styles are often confused with one another as they do bear similarities such as the use of natural materials and neutral color schemes. 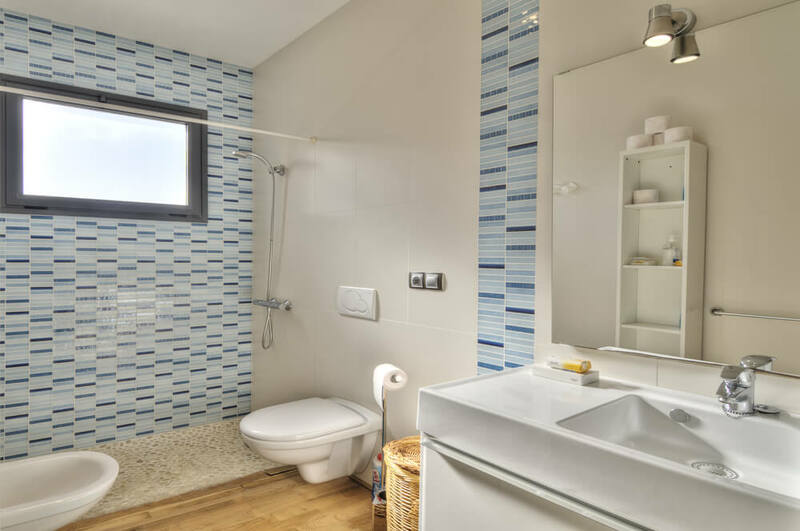 Therefore, here are some guidelines to provide you with a clear picture of the characteristics of a these styles when implemented in bathroom design. Bathrooms designed to reflect the modern aesthetic tend to feature natural materials, as well as a stainless steel and concrete. These materials are designed to speak for themselves and fulfill both functional and decorative purposes. 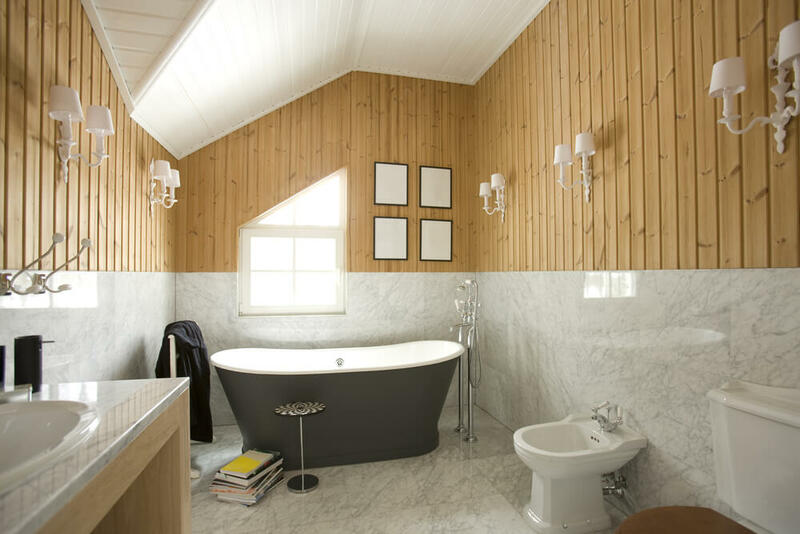 For example, a large freestanding tub may be installed in a modern bathroom. This fixture serves a purpose while its elegant, soft curves and glossy finish provide beautiful focal point for the space. In modern bathrooms, natural greenery such as a row of succulents or a small tree are great accessories. These can be displayed on a vanity or on a large open shelf above the bath tub. Hidden storage is key in a modern bathroom as these spaces are not meant to be cluttered. If you are remodeling a small bathroom into a modern space it is important to consider installing additional storage to hide clutter. This is where it may be advantageous to opt for a vanity with drawers rather than a pedestal sink or one with exposed plumbing as it will provide essential storage for toiletries and linens. If space allows consider installing a closet or built-in shelving to accommodate the storage of towels and other bathroom necessities. Modern bathroom with floating vanity, vessel sinks and a soaker tub. Modern bathroom with white and wood cabinetry and vessel sink. A bathroom designed in a contemporary style is built and decorated to provide comfort and relaxation. The color scheme will be neutral in shades of beige, gray or gray-blue. Contemporary bathrooms tend to shy away from traditional vanities in exchange for wall-mounted sinks. 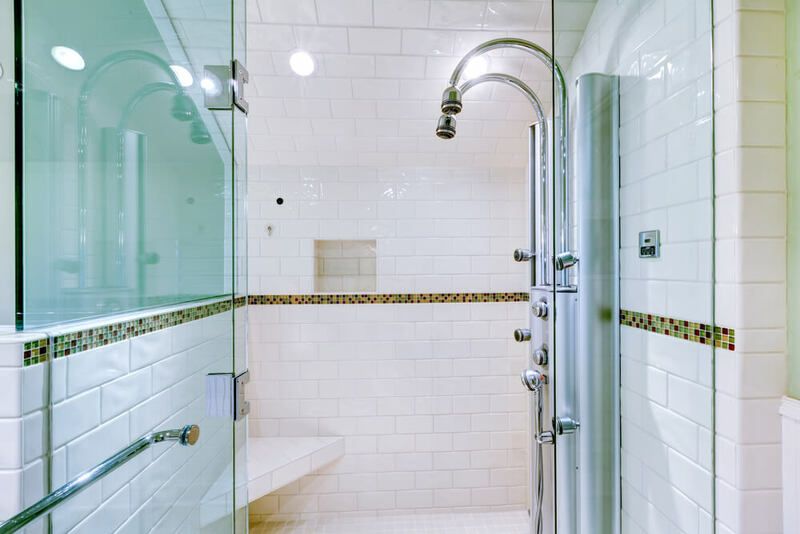 In addition, showers typically feature large glass panels rather than a shower curtain. Another way to view a contemporary bathroom is to see it as a tailored outfit designed to fit the homeowner perfectly in both style and function. Lighting is another important element in a contemporary bathroom. This may involve light from a window, skylight or additional fixtures in the space. 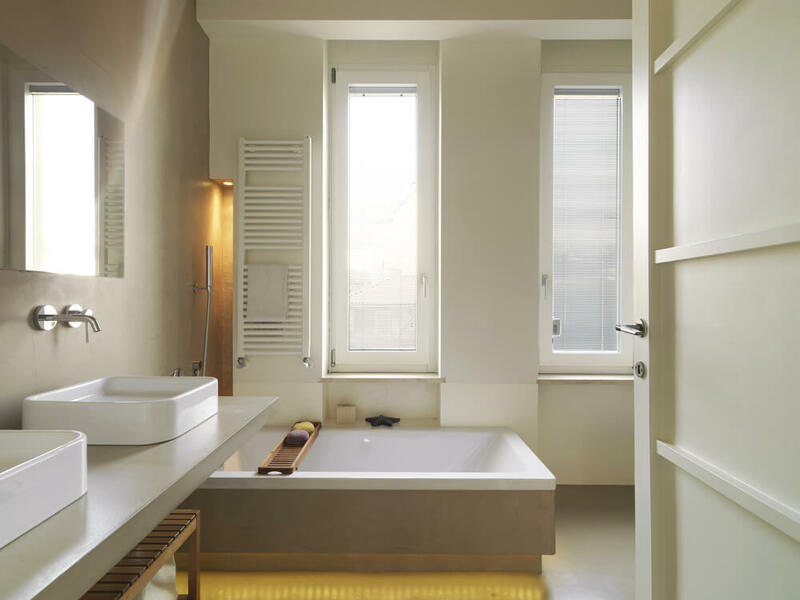 Regardless of the source of the light, the quality is the more important factor as it is important for this type of bathroom to be bright and airy. Wood cabinetry, from cherry to espresso, is often utilized in this type of bathroom. The wood tones provide a natural feel in the space while adding depth and warmth. 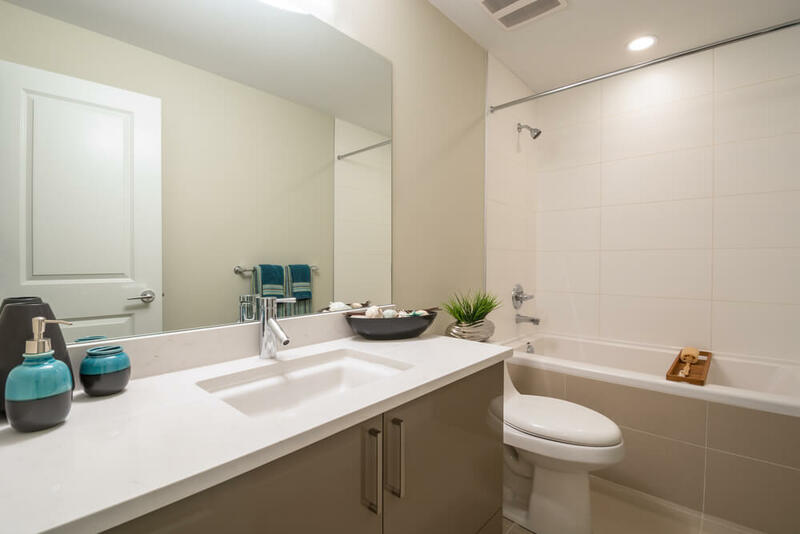 Contemporary bathrooms typically feature tile applications on all levels, from the flooring to shower and the bathroom walls. This adds to elegance of these beautiful bathrooms. Contemporary bathroom with warm wood cabinetry and floor-to-ceiling tile. 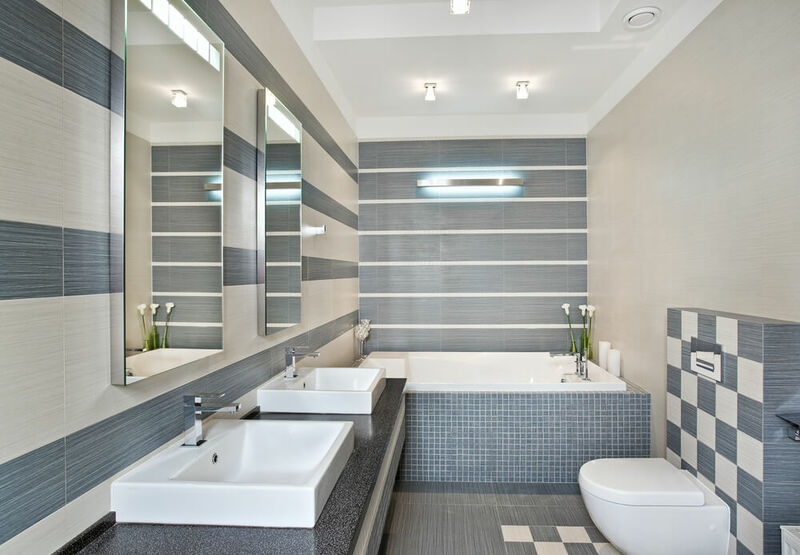 Contemporary bathroom with horizontal striped gray and white tile.